In 8-inch heavy skillet, heat vegetable oil over high heat. Reduce heat to medium; fry tortilla pieces in hot oil 30 to 60 seconds or until crisp and golden. Drain on paper towels. In 10-inch skillet, heat olive oil; add onion, and cook about 2 minutes or until translucent, stirring occasionally. Add tomato and tortilla chips; cook 2 minutes. Mix in eggs, salt, pepper and chiles; scramble, and when everything is perfectly combined, add cheese and let it melt. 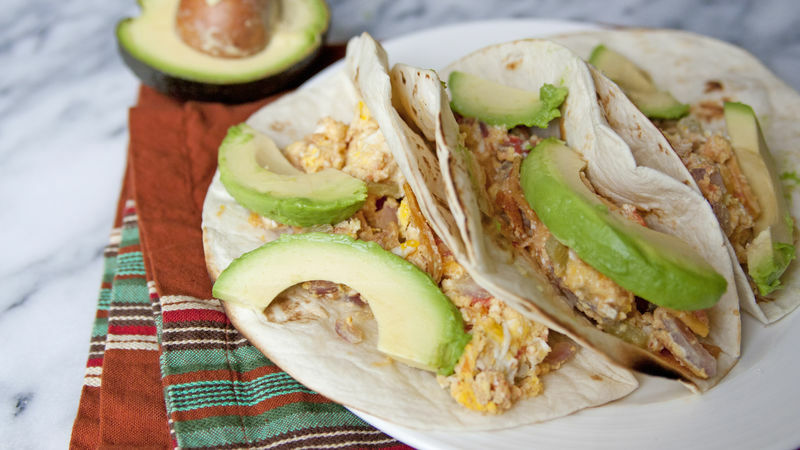 Wrap the migas in warm flour tortillas; garnish with slivers of avocado slices. Migas also makes a delicious filling in burritos. When working with chiles, wear plastic or rubber gloves. If your hands do touch the peppers, wash them well.